Hey folks, Valkor here. The folks over at Sega must having a wonderful Christmas, freak that a wonderful year, because they freakin owned 2010 with a slew of titles that, in my eyes, were big hits. 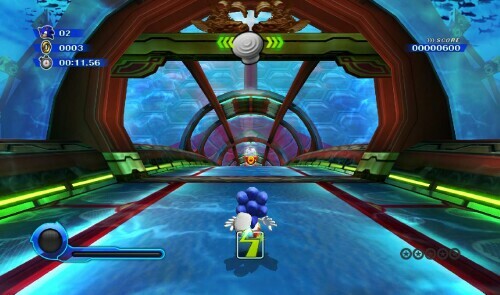 Speaking specifically, in the month of October, they brought the little blue blur, "Sonic the Hedgehog" back to his 2D roots in Sonic 4, but not stopping there, they went and 1-upped themselves and reintroduced him into the 3D world (with a mix of 2D), keeping the speed alive, while adding some new moves and abilities. What the hell am I talking about? 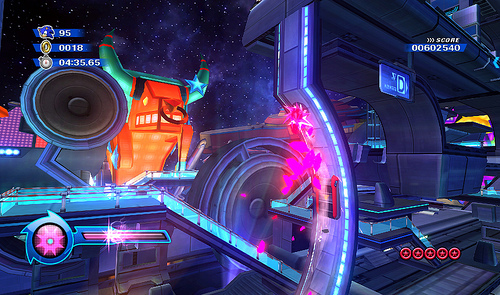 I'm talking about Sonic Colors for the Nintendo Wii and the DS. In Sonic Colors, Dr. Eggman (no more Robotnik… bummer), has had a change of heart. Feeling bad for all the things he's done in the past, he wants to make it up to the world by creating an "interstellar theme park". 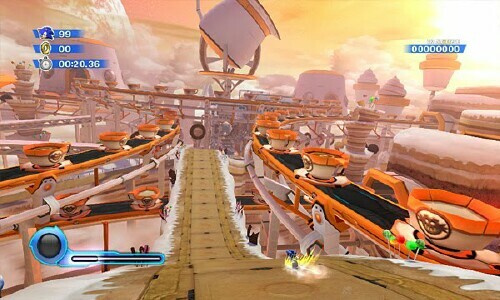 But Sonic, along with buddy Tails, don't think old Eggman is on the up and up, so they set out to investigate this new wonderland. Lo and behold they meet a creature called Yacker, who's a Wisp. And from Yacker they learn that Eggman is actually using the Wisps as part of his evil schemes. 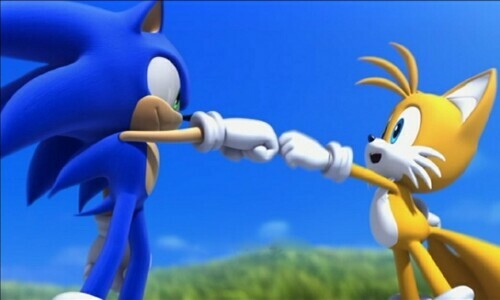 So it's your job as Sonic to free the Wisps and put an end to Eggman's plans. 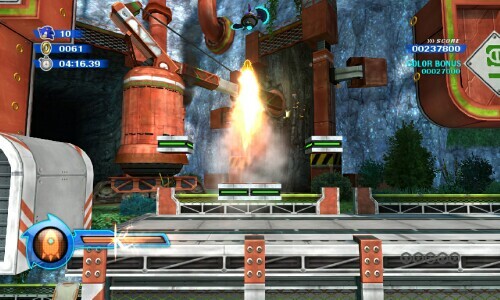 The controls in the Wii version of Sonic are quite simple – you use the Nunchuck to control Sonic. You have a standard jump, a double jump, of course the dash, and now there are situations where you'll need to "slide" under narrow crevices. You also have a honing attack, where you lock on to targets, but your true abilities are revealed when you free certain colored Wisps and exploit… oops I mean utilize their abilities with the Wii-mote. For example you have the yellow Wisp which lets you drill, the Cyan Wisp turns Sonic into a laser and you can bounce off walls, the white Wisp gives sonic a boost in speed, and the orange Wisp shoots Sonic upwards and glides him back to earth. When you start the game, you'll see silhouettes of the colored Wisps, so you can't use them until you find them. Once you do, you can replay the stage, which will allow you to access areas you couldn't before or find special objects. 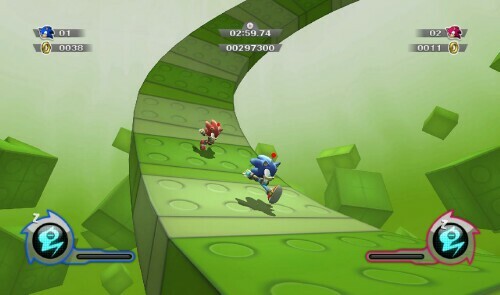 The level designs are a mix of 2D and 3D; in 3D you'll race through a course of obstacles that makes great use of Sonic's speed through crazy loops, twists and turns. 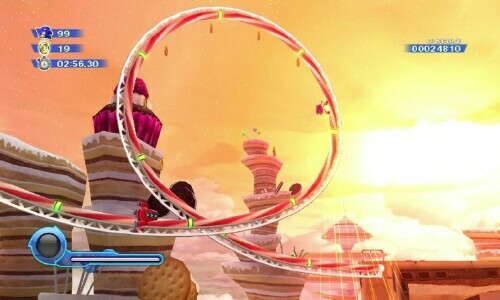 Sometimes you'll play on rails (like a cinematic, where you mostly get to watch Sonic run through a course, but can't control much), where you're prompted to press a button in order to perform an action, which looks way cool and never gets dull seeing it over and over again. In 2D, you're speed isn't required as you take a more hop and bop stance, with some speed runs as well. Each stage follows a particular theme and as you progress the game gets increasing more difficult… wait did I say difficult? I meant "challenging". Of course you get everything else that's Sonic related, such as collecting 100 rings for an extra life, a letter grade score, and huge boss battles, with the final showdown against the Eggman himself and his Wisp machine. So after spending much time with Sonic Colors, what can I honestly say about the game? I'm gonna say it and I think most will agree – Sonic Colors is ten times better than Sonic 4 and it could quite possibly be the best Sonic game… EVER! I truly love the character and most of the games that preceded it, and I was quite pleased with everything that was done with Sonic 4. 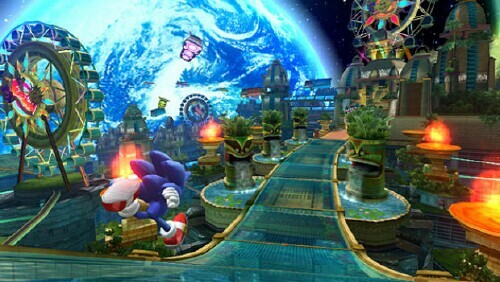 However Sonic Colors just feels oh so right. For starters the controls are spot on perfect and so smooth, though the jumping can get a little wonky, especially in the 2D parts; I got past it and strived onward. The graphics are so amazing on the Wii… ON THE WII, a system that decided not to go the Hi-Def route spits out some amazing visuals. I'm beside myself! What excited me most about the game is that crazy sense of speed, and I'm talking that churning your guts, rollercoaster type speed that's too fast, too furious… it's just sick and oh so slick! Am I exaggerating? Not by a long shot. The music is loveable, bouncy, and loads of fun and I give it up to Cash Cash for getting things started with "Reach For The Stars" (loved that instrumental variation when you fight Eggman). Finally Super Sonic… is in… the game… oh… my… god… (of course you can only unlock him once you find all the chaos emeralds, but he's in there). 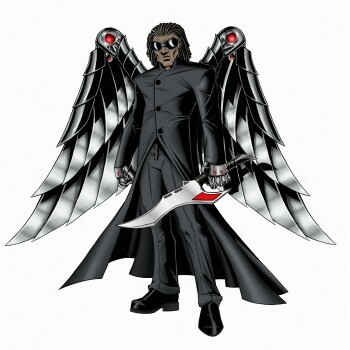 I'm gonna say it and I might get some flak for this, but I'm not too keen on the Wisps. Wait let me rephrase that, I'm not too keen on not having the use of their abilities from the start. When I began my run, I looked at this yellow silhouette and wondered "where the hell was my Wisp?" Why can't I use them from the beginning? Second, do I REALLY need them, I mean at all? If you NEED to uncover every nook and cranny this game has to offer then yes you need to find them all, if not you can breeze right through the stages without them. I say it's "not so bad" because it doesn't distract from the overall fun of the game, which is a blast, but I'd rather have use of the Wisps from the start. Just sayin. 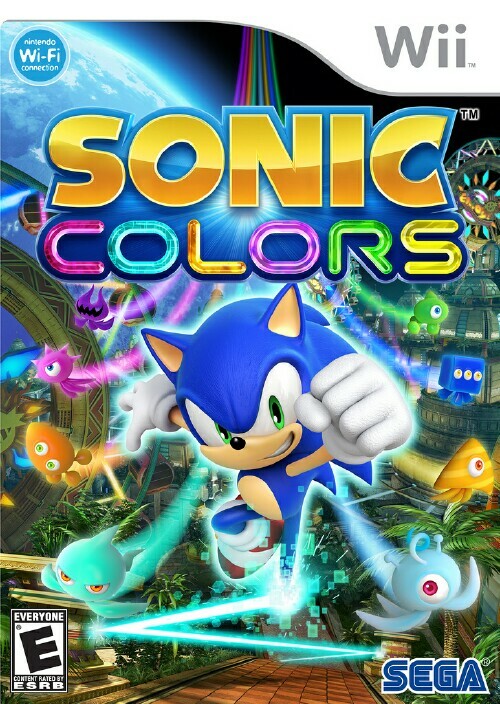 When I first heard of Sonic Colors, I was a bit put off by the title. And when I saw some screens, I wasn't impressed. But when I got some hands on time with the game, initially at E3, later at the Bryant Park Event here in NYC, and finally at home, I can honestly say without a doubt, Sonic Colors is one helluva game - a great mix of 2D and 3D, insane level design, and music that won't cause you to hit the mute button on your remote, rounds out this perfect title. And perfect title gets a well deserved perfect score of 5 out of TOV 5 stars, even with my objections; I'd still dip into the world of Sonic Colors again and again.